From web development to speaking, here are some things we’ve done in the past. Can we help you with something like this? Contact Us from the menu, below. Why do web designers hate SEO so much? On November 7th, 2013 I was invited to speak at SEMCLT about Google Authorship. My associate, Kelsey Lee, helped with the presentation. I was invited to speak to Social Media Charlotte (SMCLT) Breakfast on January 24th, 2013 about how social media is changing SEO. 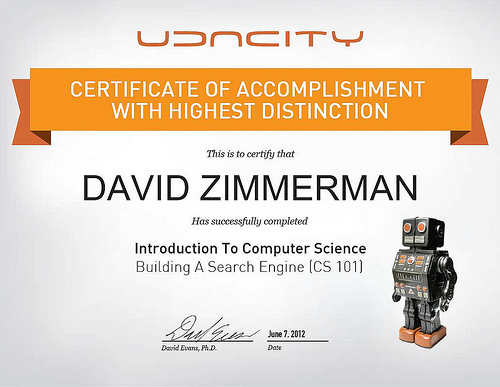 I have recently completed my first Udacity class- CS 101: Building a Search Engine- and received a Certificate of Accomplishment with Highest Distinction.